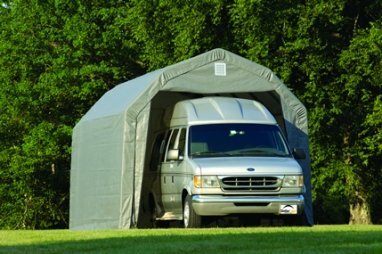 A portable garage might be something that you and your friends would dream about but feel to be an impossibility. Not so fast! 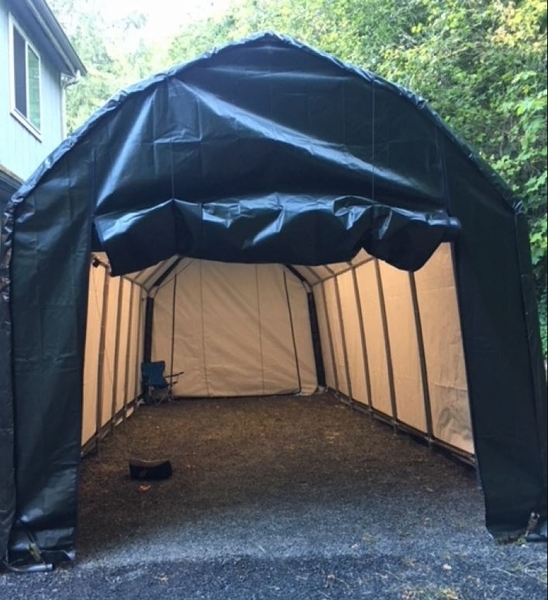 Shelter Logic has invented such an item that is designed to be portable as well as provide all of the features that are expected from a garage. 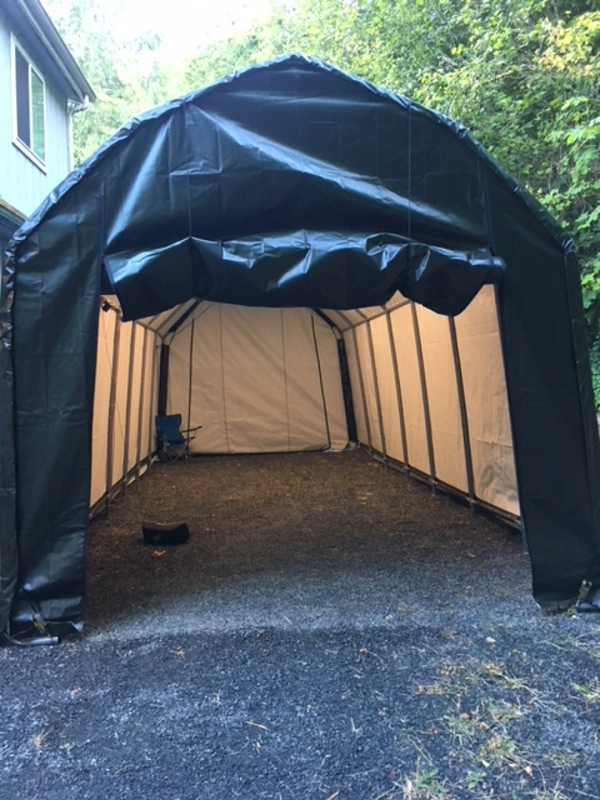 Coming in the dimensions of 12 feet by 28 feet by 11 feet, the Barn Style Portable Garage Canopy comes in the color of green and is just the right solution for whatever your needs might happen to be. This unit does not have a snow load rating. You would need to make sure to keep the snow from building up on the unit. Please view our Snow/Wind Rated shelters here. 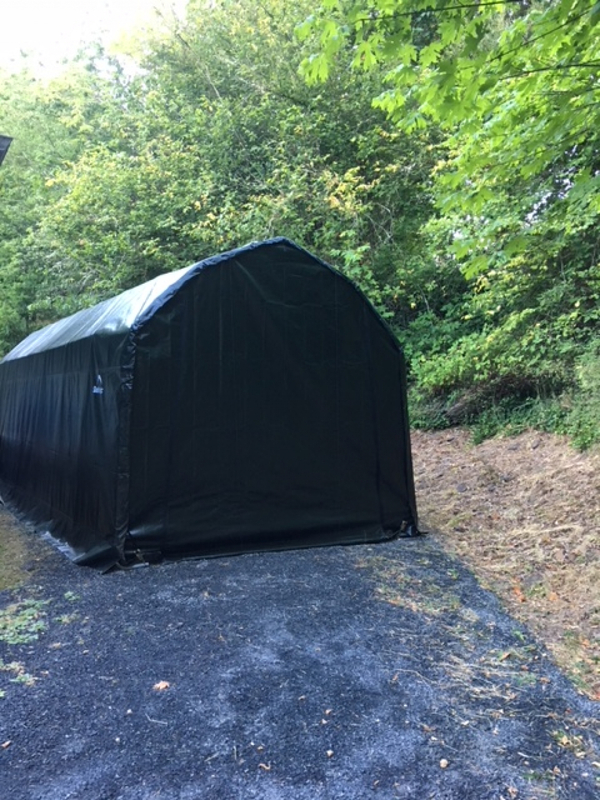 Is there a door/opening on each end of this portable garage for driving a tractor straight through? There are indeed doors on both ends of this shelter. Can I get this item with free shipping if I order tomorrow by 12:00 noon? I need to verify some measurements on what I need. Yes, we always have free ground shipping for orders over $99 shipping anywhere to the connected 48 states. The garage comes in 6 boxes. How long are they and will this fit into an 8' truck bed? The shipment consists of 5 boxes measuring approximately 47" x 20" and one box measuring 28" x 10". It seems that these should pack into your truck bed with no problem. The width and length for this product is fine for my pontoon boat, but what is the height of the door? The height of the door is 8' 6". 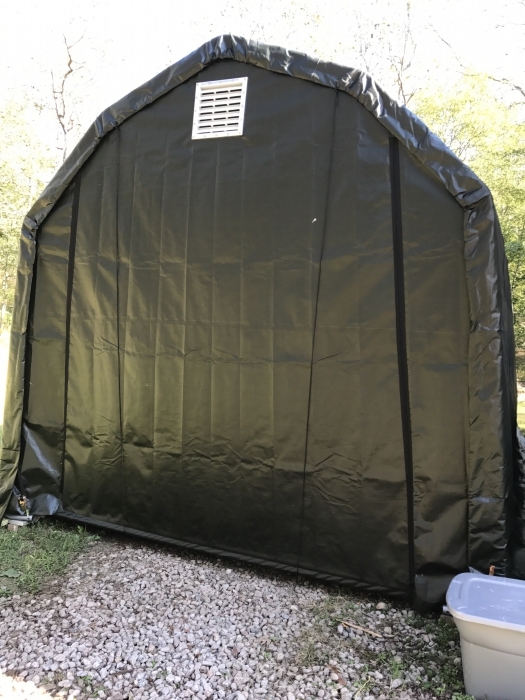 Can the door be left off the front to increase the total access height? I have a ski boat with a tower and need a total height of about 11 ft. Are there different products that offer more opening height? The door may be removed. 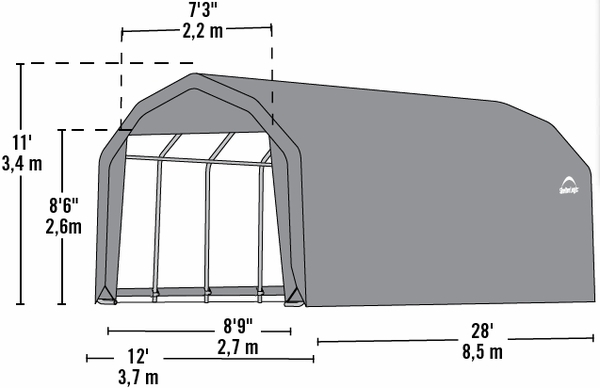 For a shelter with additional clearance, you may consider the Shelter Logic 14 x 28 x 12 Peak Style Portable Garage Canopy. Will this product stand up to winter? I live in RI and although we do not always get that much snow we can from time to time get good size storms. I would be using this to store a farm tractor, log splitter and things of that nature. I need the height the barn style offers but I could also go with the rounded design. This unit does not have a snow load rating. You would need to make sure to keep the snow from building up on the unit. There was great communication from the company about delivery dates and what my responsibilities were before accepting the delivery. The six boxes though came wrapped and on a pallet with no damage. The instructions recommended three people to complete the project but I was able to assemble nearly the entire structure and then used two helpers for about 20 minutes on two occasions. I had no issues in getting the shelter assembled. ProsEverything fit together well. There were more than enough nuts and bolts. This is a sturdy structure that I'm sure will effectively hold or shed the wet snow we get here in the Pacific Northwest. ConsFor the roll up door the pulley system works fine with just one rope fed through the pulley but it is necessary to put two ropes through one pulley and I found that one rope was frequently getting jammed. A double pulley would be the better option and I did purchase a small pulley and added it to the one requiring two ropes. I highly recommend downloading the instructions as opposed to using the one that came with the shipment. The product is adequate to cover my 233 Chaparral boat. The color in the advertising picture is not what I received. My cover was a dark green. The instructions need to be updated with more and better details. The plastic parts holding the vents in place were useless. They kept coming undone after being pressed together. Suggestion. Supplying plastic bolts with plastic wing nuts would be a better alternative. I used ss bolts and nuts. Assembly took longer than expected.. Some items you assemble and then disassemble to complete another step only to reassemble. Example; the pipes along the two longer bottom sides were assembled to square/align the product. Then unassembled to insert those bottom pipes into the tent cover to hold it in place. Then the pipes were reassembled to the structure. Would I purchase this again; probably yes. It took me a little longer to put together than I had anticipated, but I am very satisified with the end result. 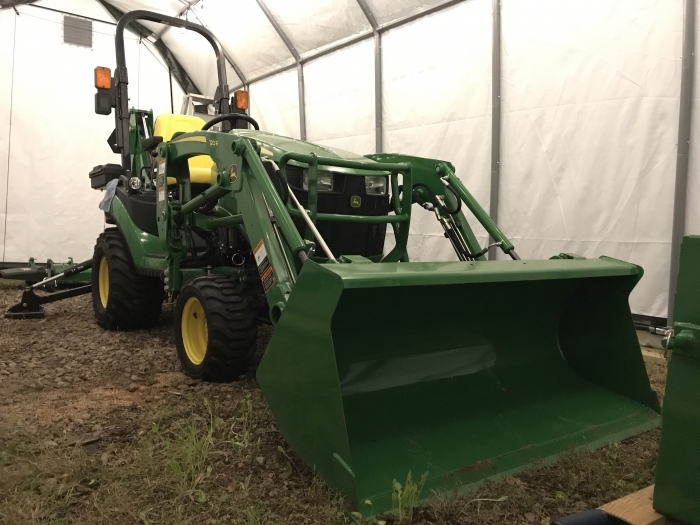 This shelter is the perfect height for the overhead clearance of the tractors ROPS bars and there is even plenty of room for a few tractor implements. We'll see how it holds up over the next couple of years I expect to get out if it. ConsThe included vent kit plastic rivets had to be replaced with stainless steel bolts and nuts.